As the Autumn winds gather strength, our 10kW wind turbine has this week passed a significant generation milestone. Since the turbine was connected on October 30th 2012, it has generated 100,000kWh of electricity. That is enough to power the average UK household for over 21 years! Being our first community energy project PCP are pleased to confirm that despite some initial teething problems, the turbine is performing slightly ahead of our business plan projections. Our Community Fund has to date given away £2,800 to local projects, including £1,400 to the Community Foundation for Calderdale Flood Relief Fund. Together with installing a solar array on Colden Junior and Infant School, we are currently working towards our next share offer which will we hope to launch in the upcoming weeks. Please like us on Facebook and check back here to receive the latest updates. In Calderdale, Colden Junior & Infant School’s pupils have started the new school term with solar panels providing clean, green, renewable electricity to power their learning. The panels have been provided to the school by Pennine Community Power (PCP), with grant funding of £16,000 provided by the players of the Postcode Lottery Trust. Additional grant funding was provided by the Community Foundation for Calderdale, Friends of Colden School and Blackshaw Environmental Action Team (BEAT). Local installer EcoHeat & Power Ltd installed the system over the summer holidays in time for the return to school. The 10.71kW system has 42 REC panels and a display monitor in the hall so pupils can see how much electricity is being generated, this will also link to a display on the school website. The estimated annual generation is 9,489kWh saving 4,080kg of CO2. PCP has also provided teaching resources and solar models for the pupils to use in class to learn about renewable energy, climate change and technology. In October a Green Fair will be held to celebrate the launch of the PV panels. Postcode Local Trust exists to fund community groups and charitable organisations through a variety of grant giving programmes. To do so, the Trust relies solely on funding from the proceeds of tickets sales from People’s Postcode Lottery. When you sign up to play People’s Postcode Lottery, your postcode is your ticket. It costs £10 for 10 draws paid monthly in advance with prizes every day. A minimum of 27.5% goes directly to charities across Great Britain and internationally. Whilst PCP has been publicly quiet recently, behind the scenes our Directors have been working to adapt our plans to the altered landscape facing community energy since the raft of policy changes initiated after the last general election. From drastic cuts to the Feed in Tariffs (FiTs), altered tax relief status for community projects, to stricter planning controls, it has not been an easy time for small organisations to make progress, or indeed to survive. Fortunately we have some experienced Directors who have used their particular expertise to help formulate different funding arrangements for community projects. We hope to make an announcement about two solar projects in the pipeline very soon. At the AGM in February our members agreed to donate the £1400 community benefit fund to the Community Foundation for Calderdale’s Flood Relief Fund to support the wider community as it recovers from the serious Boxing Day floods. Our 10kW turbine is performing well, having generated enough electricity to make 2,530,845 cups of tea so far (93,735kwH since installation), saving 43.3 tonnes of CO2 emissions vs grid sourced electricity! Since our last update, we’ve been busy working on some promising solar power projects in the community. However, due to the hastily announced Government proposals to radically scale back support for renewable energy, we are reviewing the viability of these projects. We hope to be in a position to announce our upcoming plans before the upcoming AGM in November. In the meantime, please note that the kWh counter on our turbine datalogger has reset itself, so that although it currently shows 7,000 plus kWh total generation we have, in fact, generated over ten times this amount since the turbine was commissioned. 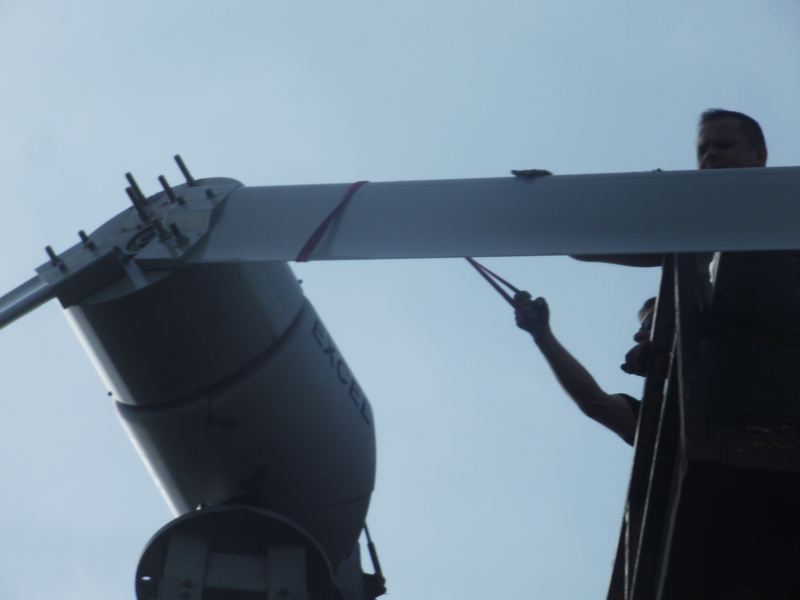 After several months wait for conditions of zero wind, we were finally able to change the community wind turbine blades in July. The old blades were found to be seriously worn on the leading edges and we believe that it was this that was the cause of a chopping noise that was audible in very high winds. The new blades were supplied by Bergey and are a new design with stainless steel leading edges, which are far more resistant to wear. The new blades appear to be quieter already and the tail end of Hurricane Bertha that passed through on Sunday 10th August saw very high winds without the nuisance noise. We are continuing to plan additional measures that will increase the efficiency of the turbine, including looking at using surplus energy to heat nearby houses when local grid conditions do not allow all the electricity, which can be generated, to enter the grid. Just a quick update on our AGM which was held at the Great Rock Co-op on Saturday the 23rd November 2013. A good turnout of members heard the Directors give their annual report, the financial report and some exciting news on projects in the early stages of development. Please keep checking back for further information on our next steps. or look us up on Facebook. As Pennine Community Power was in receipt of grant funding (State Aid) towards part of the installation of our community wind turbine, our Feed in Tariff payments have been suspended by OfGem, for the last few months, until this grant funding was repaid. This situation was contrary to the advice we received at the time of installation ie that Lottery Funding was not State Aid and that even if it was then it was below a de minimis threshold. Both pieces of advice were proved to be wrong. As a result the Directors have had no choice but to negotiate with OfGem as to how much of our grant funding would need to be repaid to the Lottery. We arrived at a figure of just over £8,800 and this money, which has been raised by issuing additional share capital to existing members, has been paid to the Lottery. We now anticipate our FIT payments being reinstated. Unfortunately, it is likely now that the community benefit will be slightly reduced as the income of the turbine now has to service a slightly larger share capital. On a brighter note, the turbine itself is producing at or slightly above our predictions. The Directors are also still pursuing modifications to the turbine with the manufacturer and installer to address the noise issues at very high wind speeds. Following a successful AGM at the Blackshaw Head chapel, a group of the Pennine Community Power member/shareholders visited the turbine nearby, which was generating about 1.5 kWh in the light winds at the time. Tired of watching the X factor? We have produced 57 kWh of electricity in the last 24 hours.